... who dresses up her dogs. In my defense, we've had some real weather the past few weeks. It's been cold. And you may think the pitties are tough, but they have delicate sensibilities. They easily catch a chill. And Tommy hates the rain. Hates it even more than wearing his yellow rain coat. This is the most hilarious, most adorable thing! I love the pictures. I've thought of getting Boz a nice sweater but he seems okay without it. I guess the Boxer in him keeps his pit bull side warm. I get the feeling Boz is hot-blooded. Glad you like the photos! Kelly would run for the snow if I tried to put one of those on her!!! She much prefers laying in, rolling in, playing in the snow with just her fur coat!!! Sue - I have 2 yellow slickers that don't fit my big boys and I was going to send them to you for your two. Now that I know they are so fashionable and that Tommy already has his own slicker, maybe you wouldn't want them! I must say, you do have some very chic looking animals, there. Happy New Year to you all! Ralph Lauren has nothing on you.....I love the looks on your doggies faces..."really Mom?!?". Happy New Year to you and the gang, and may 2013 be filled with many blessings!! 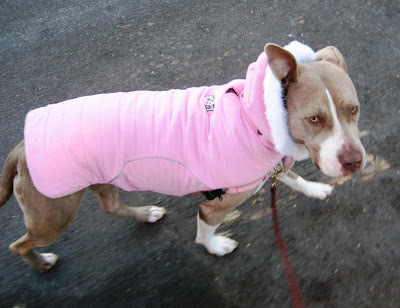 KBF, I know... a pink coat! But some people are scared of Louise, and the pink softens her image. Maybe the sweater was itchy? 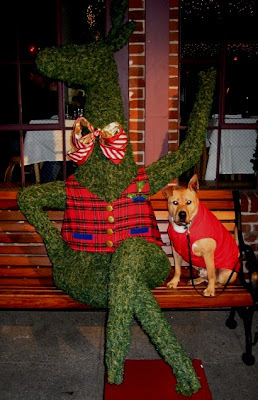 Tommy & Louise LOVE their winter vests. Chieftess, I would love to see the pitties in the snow. Kelly has a nice warm coat; Tommy & Louise are desert ghetto dogs. Kari, I MUST see BC in clothes. Liz, you're so generous. Thanks for thinking of us. Happy New Year to you and your pack! 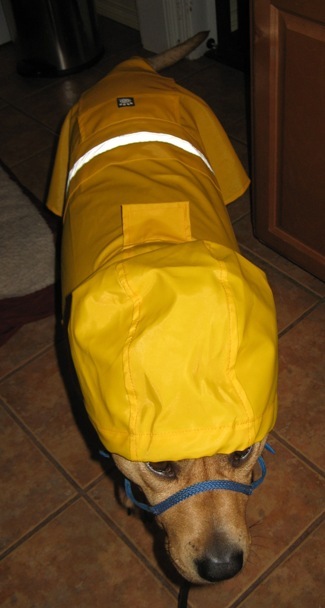 Lynnie, the truth is Tommy likes his rain coat. He really does! Did the neighborhood dogs laugh at him? Beneath Tommy's tough exterior must lie a softie: my old dog Tessa would have bitten me if I'd tried to dress her. Last year I met a man with a pitbull in London, who was wearing a pink feathery collar (the dog, that is), and my grandson loved it. The man said he put the collar on his beloved dog so people wouldn't be afraid of him and cross the street. It worked with us! to happen next! Love it. bit more of fear in her eyes than Tommy, is that right? I love you honey and think of you often. Kiss to your baby kitten girls too - the easy ones. OMG ! i have become one of these people too ! Lou is working that pink frock. 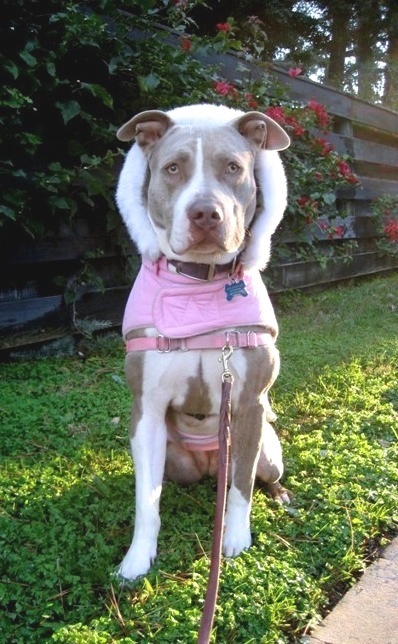 We got a coat for Scout once. She looked at me like, "Really.?" btw: gray and pink was the color combo of choice for girls working the western pleasure horse circuit back in the 70's. Something I bet you didn't know. They look adorable with their dresses! and serious with his red pullover and yellow rain coat. Both are charming. Thank you Susan, for your lovely and affectionate comment on Karin's post! It warms my heart! I can tell by Tommy's facial xpression just how much he loves your clothing idea. Tommy, you're a caution. 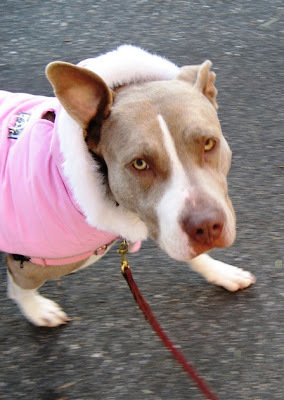 Louise, you're a beautiful pittie in pink! 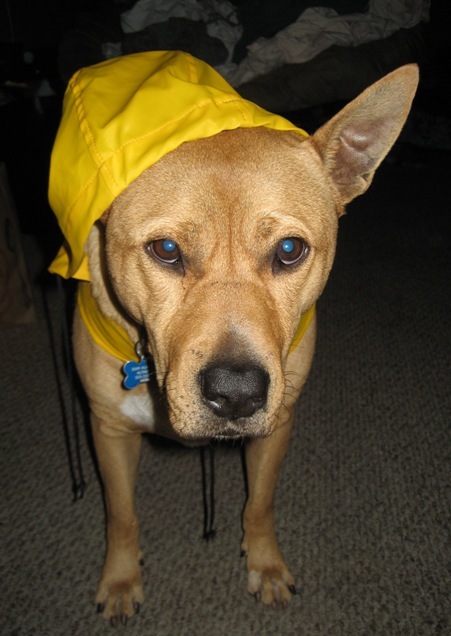 I am very tempted to get Ranger a raincoat, thank you for setting precedence as it makes the decision to move forward with it that much easier. He does have a Thundershirt which he loves, it is very calming for him and when I pull it out he get's very excited. 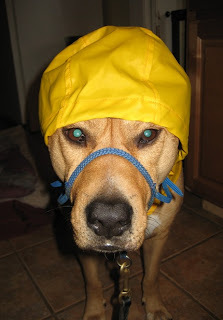 Uh oh Tommy, looks like rain got your hoody on? Cool pics Susan. A Very Happy Easter to you and your loved ones! Thank you, Sonia! It's so sweet of you to stop by. You warm my heart. Happy Easter and lots of love to you and your family. Hi Susan. Thank you for stopping by and commenting. I used to be so scared of pit bulls until I started volunteering to take photos of the animals at my shelter and adoption center. Now, just like you, I'm in love! And Tommy is so darn cute and really seems to be enjoying himself...He's a lucky fellow. Hi Stickup Artist, I'm so glad you crossed over to the other side and are now in love with pit bulls. They have a way of weaseling into your heart. And that's great that you take photos of shelter animals. I'm sure your artistic eye helps them to get noticed and adopted. Thank you for volunteering!